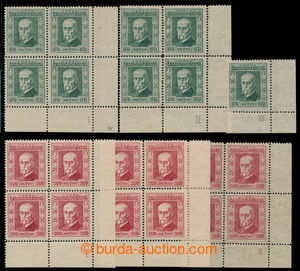 1926 Pof.183-184 plate numbers, Festival 50h green, 3x corner block-of-4 with plate numbers: plate number I with wmk P5, plate number II with P7 and plate number III with P5 + ditto 100h red, plate number I with P5, plate number II with P5 and plate number III with P7; lightly hinged on upper pairs, exp. by Gilbert., Vrba, cat. 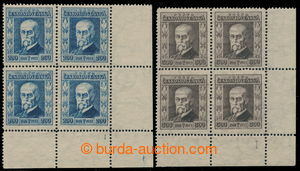 9.750Kč, sought! 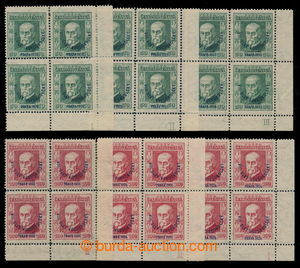 1926 PLATE PROOF Pof.186, Festival 300h brown with trial printing of added-print in black color (issued with red additional-printing), wmk P7; mint never hinged, certificate and exp. Vrba, rare! 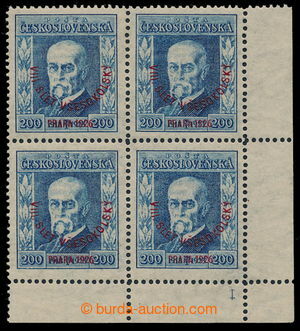 Pof.195 P3, Masaryk Gravure 2Kč blue, type II with extremely rare vertical watermark P3; viewing of quality recommended - repaired perf and tearing left at top, after all scarce stamp, certificate Vrba, exp. by Karasek., cat. 80.000CZK!